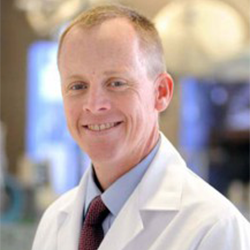 Dr. Parsons is a board-certified pediatric oncologist and Associate Professor of Pediatrics at Baylor College of Medicine and Texas Children’s Hospital in Houston, TX. He is the Director of the Precision Oncology Program at Texas Children’s Cancer Center (TCCC) and the Co-Director of the Neuro-Oncology Program and the Cancer Genetics & Genomics Program at TCCC. Dr. Parsons’ work has been instrumental in the characterization of the genetic landscapes of a variety of pediatric and adult cancers, including the first identification of IDH1 and IDH2 as critical oncogenes in gliomas. His current research primarily focuses on the clinical application of genomic technologies in pediatric cancer care. Dr. Parsons was one of the principal investigators of the BASIC3 clinical exome sequencing study (2011-2017) and currently helps lead the KidsCanSeq study (2017-2021) the NHGRI/NCI-funded Clinical Sequencing Exploratory Research consortium. He is the Children’s Oncology Group (COG) study chair for the NCI-COG Pediatric MATCH study, the first nationwide precision oncology clinical trial for children with relapsed and refractory solid tumors, lymphomas, and histiocytic disorders. Dr. Parsons received his B.A. (chemistry) from Princeton University and his M.D. and Ph.D. degrees from The Ohio State University College of Medicine. He completed his pediatric residency at Johns Hopkins University and his oncology/neuro-oncology fellowship training at Johns Hopkins and the National Cancer Institute.